China's central bank raised the benchmark interest rates on Tuesday for the fourth time this year in an effort to prevent the economy from overheating and curb accelerating inflation. 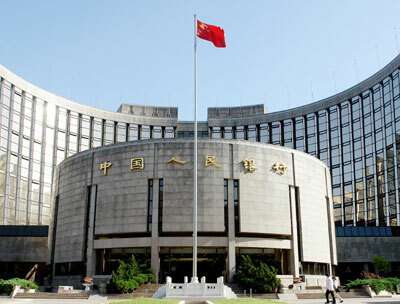 The one-year deposit rate will increase 27 basis points to 3.60 percent, while one-year lending rate will rise by 18 basis points to 7.02 percent, effective on Wednesday, the People's Bank of China said in a statement on its website. The increase is aimed at better steering bank credit and stabilizing inflation expectation, according to the statement. The timing is somewhat of a surprise as the central bank usually announces interest rate changes during the weekend in the past. However, the latest hike is not totally unexpected given mounting concerns about overheating economy and accelerating inflation. China's gross domestic product grew 11.9 percent in the second quarter this year, the fastest recorded in a decade. In July, the trade surplus rose 67 percent from a year earlier to $24.4 billion, the second-highest monthly total, and the money supply climbed 18.5 percent, the biggest increase in more than a year. Fixed-asset investment in urban areas increased 26.6 percent in the first seven months from a year earlier, close to the 26.7 expansion in the first half. The Consumer Price Index, a barometer of inflation, jumped by a 10-year-high 5.6 percent in July, well above the official target of three percent. The inflation rate is also higher than the deposit rate, indicating a loss of purchasing power if people put their money into banks. The low interest rate policy has somewhat encouraged an exodus of bank savings to the country's skyrocketing stock market, which has soared more than 80 percent so far this year on top of a 130 percent rally in 2006. The benchmark Shanghai Composite Index jumped more than 5 percent on Monday, followed by a one percent increase on Tuesday, edging closer to the historical new high of 5,000 points. Tuesday marked the fourth interest rate hike so far this year. The central bank raised the rates on July 20 when the benchmark one-year deposit rate rose to 3.33 percent. That rate hike is coupled with a reduction of interest income tax on bank deposits to 5 percent from 20 percent. Besides interest rate hikes, the central bank has ordered banks to set aside more money as reserves for six times so far this year.